Why are there Tears in Bengali Eyes? Have you noticed that the City of Joy has turned out to actually be a City of Billboards? The skyline as viewed from the roads is plastered with huge hoardings. If only they were placed somewhat lower, they could hide the squalor directly below. The displays for luxury apartments hang directly over the shack dwellings; advertisements for purified drinking water cast a shadow over the polluted cesspools that are the byproduct of cleaning and washing by the shanty dwellers. Then there are displays for fancy snacks and beverages, frowning directly on the people down below who live on less that one dollar a day. But the advertisers have a point in placing their billboards here, for they are not meant for the pedestrian hoi polloi, you can only view these displays from a distance if you are riding an automobile. In addition to the billboards, Calcutta has a tradition of roadside walls and building facades covered with paper posters, to be on the eye level of the passers by. The billboards are gaining in prominence as the car population in Calcutta is climbing exponentially every day. The posters are still there, but for the benefit of the politicians seeking your votes and cheering you up to attend a huge rally for protesting something the government has done. They probably recognize that many people who can afford a car do not even vote at the election time or care for protesting all that is abysmal around. But if you think the protest is from the out of power opposition party only, you will be wrong. Unless you run down the establishment in a public platform you have a fat chance of being heard. So the ruling party protests their own action and denounce themselves in those huge rallies-everyone negating everyone else and sometimes the self also. There are also posters for low budget Bengali movies, which are not ones that car owning intellectual middle class of Calcutta watches. Bills for miracle herbal medicine and promises for the cure of all sexual dysfunction or offering a year of computer education with the assurance of a job, possibly followed by a placement in America are in abundance too for the eye level masses. Educations being a major, if not the only industry in Calcutta, revenues generated by education business are substantial. Not surprisingly, advertisements inviting enrollment in sprawling high priced private schools and ubiquitous professional business and technical colleges are subjects reserved for billboards. Yet Calcutta billboards are quite fascinating and sometimes intriguing. For example, some advertising campaigns start with teasing questions aimed at generating curiosity in viewers’ minds. Assuming, the answers will be forthcoming shortly, people start speculating about what it could be and guess what would be the product being promoted. That certainly raises curiosity and interest as a marketing strategy. Recently, one such billboard introducing yet unknown merchandise was all over the city. The question posed was “Why are Bengali eyes tearing up?” with a likeness of the renowned writer Sunil Ganguly looming large. Mr. Ganguly wore a grim sorrowful look and slightly disheveled hair. What would be of such a concern for him and what panacea would Mr. Ganguly, a serious thinker and author, be coming up with? Is he referring to the Netai massacre of civilians by Marxist Communist cadre (cadre in Calcutta political parlance euphemistically means strong-armed goons)? Is he recommending throwing them out of power? Is this really a political advertisement? But not knowing his political inclination, I was not sure whether that was the correct answer. See, all writers, playwrights and artists have some political affiliation and patronage, which they do dare not to mess with. Mr. Ganguly’s distress is surely not about the high cost of Moog Dal at eighty rupees or potatoes’ being sold at forty rupees a kilogram – the billboards are out of the line of sight of folks who are finding it hard to put food on their table because of out-of-reach prices. Could it be the blinding air pollution that was causing burning eyes? That was unlikely. Why should someone spend their own money just to empathize with the fellow citizens? After much thought I finally settled on the premise that Mr. Ganguly would soon be publishing a very tragic novel which would make the Bengalis cry. That would be quite welcome and something to look forward to, as Mr. Ganguly is indeed a very powerful writer, the most acclaimed among the current throng of Bengali authors. Now, for the first time, a standard for judging the efficacy of cooking oil has been introduced – a Tear Index. Imagine how convenient it will be for Sarshe-Ilish loving Bengalis to compare a good cooking oil with not-so-good ones by reading the packaging only. If Ganesh brand claims two milliliters of tears per cooking for their product, not to be undone, Emami brand may post 3 milliliters in their packaging. It also reveals for the first time to his numerous fans and followers around the world that Mr. Ganguly also cooks an occasional meal or two enjoying first hand his sentimental mustard oil moments. The trivialization of the Bengali ethos and evoking grave sentiments in a certain population, ironically with a banality like mustard oil, that too by a serious prolific writer who has otherwise done exactly the opposite with an astute socio-political representation in literature, to say the least, sounds inconsonant. But give him credit for what is his due; for his compassion and understanding for fellow Bengalis. With all the chaos, privations, killing and banditry around, perhaps Bengalis have no feelings and emotions left; only acceptance of what is ugly and cruel in life. We have stopped empathizing; our eyes have permanently dried up. A tear or two would be timely, even if prodding from a billboard brings it upon us. 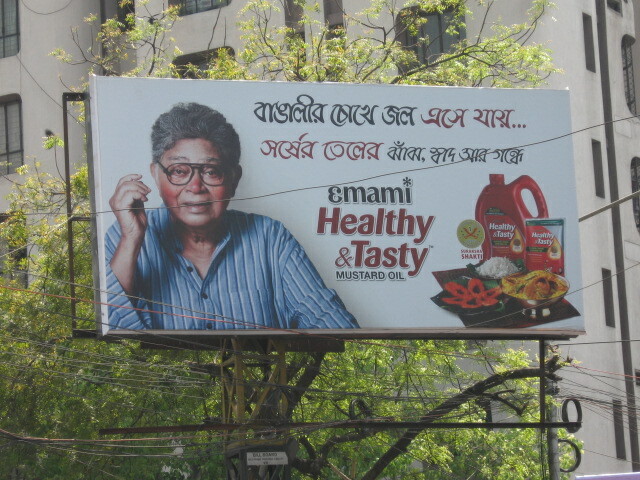 This entry was posted in Generic and tagged Bengali, Kolkata, Mustard Oil, Sunil Ganguly by sudipta. Bookmark the permalink.